FakeCarrier is a neat tweak available on Cydia that can change your Carrier Name and also enable a Numeric Battery. What is a Numeric Battery you may ask? A Numeric Battery adds an actual percentage sign next to your battery that is very handy to have because it makes telling how much battery life you have left a whole lot easier. Your Carrier Name can also be replaced with whatever text you wish to replace it with and this adds even further personalization to your iPod Touch or iPhone. If you look at the screenshot below you will get an idea of what fake carrier is possible of doing. 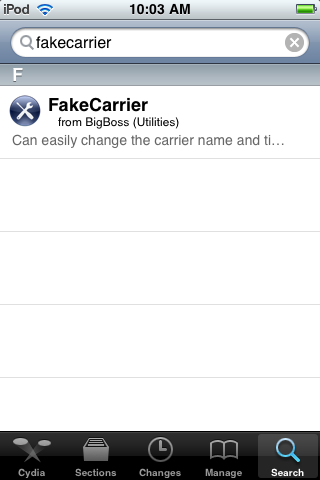 Step 1) The first thing you are going to need to do is install FakeCarrier Cydia tweak on your iPhone or iPod Touch. You can do this by going into Cydia and typing in “fakecarrier” into the search panel. 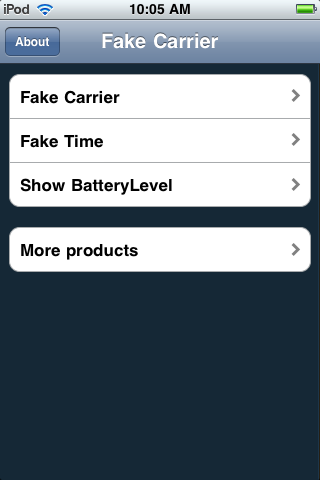 Once FakeCarrier appears on the search results click it and then click the install button. Once Fake Carrier finishes installing and finishes reloading close Cydia and continue to step number 2. If you click the FakeCarrier option this will replace your Carrier with whatever text you enter into the input box. 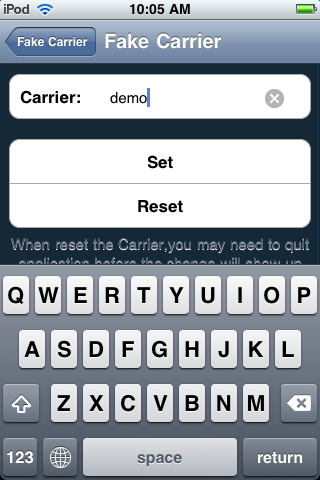 Simply type in what you want to replace your carrier with and then click the set button. If you do not like what you have typed in or wish to use your default carrier then simply press the Reset button and it will return to default. If you click the Fake Time option this will replace the Time on your iPhone or iPod Touch with a message of your choice. Simply type in what you want to replace the time with and then click the set button. If you do not like what you have typed in or wish to go back to displaying the time then simply press the Reset button and it will return to default. If you click the Show BatteryLevel option then you will have the choice of displaying a percentage of your battery life next to your actual battery image. This is very handy to have because it is a lot easier to judge how much battery life you actually have remaining. If you want to enable this feature then slide the button to the ON position and click the set button; this will now enable Numeric Battery. If you do not like Numeric Battery and wish to go back to displaying your normal battery then simply press the Reset button and it will return to default. As you can see FakeCarrier is a simple and easy to use application/tweak that can add further customization to your iPod Touch or iPhone. I personally like this tweak for its Numeric Battery option because it is extremely accurate and is very useful. If you have any questions or comments relating to this post feel free to ask your questions in the comments section. I have found fake carrier via Cydia, does it say not compatible on your iDevice or can you not find it at all? Ive had this app for about a week now. And for some reason the only option im able to click ois fake carrier. is there a reason the other 2 options are “non clickable” ? I have the same problem, how can i fix it ? Yea same prob, me too. Only d fake carrier option work not d fake time and battery life.